The Truckee boys' swim team captured the programs first state title on Saturday, May 19. Since the Nevada Interscholastic Activities Association divided state swimming and diving into two divisions in 2013, one team has ruled the field of Class 3A schools — Boulder City. 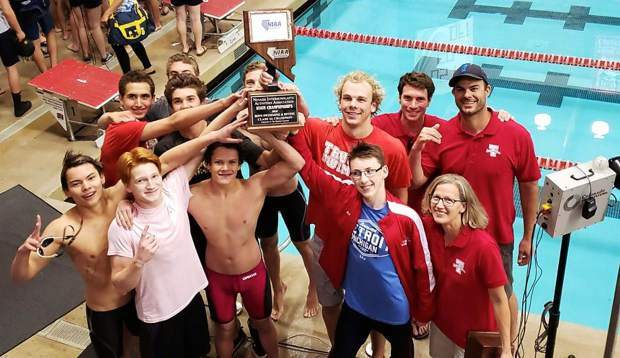 On May 19, at the University of Nevada, Las Vegas, that all changed as the Truckee boys put together a record-breaking performance to top Boulder City and earn the school’s first ever swimming state championship. Truckee outscored Boulder City 145-124, behind a trio of record-breaking swims from senior Cooper de Ryk and freshman Kaikea Crews. The Wolverines also swept the three relay events to end the Boulder City boys’ run of state championships. Truckee’s meet started with Crews, Aaron Bronstone, de Ryk, and Gavin Olsen capturing first place in the 200-yard medley relay with a time of 1 minute, 35.55 seconds, topping second place, Boulder City, by nearly four seconds. 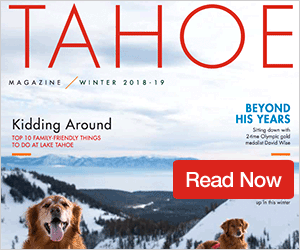 Crews then hit the water for his first individual swim, and brought Truckee another gold medal, topping the field by more that four seconds to take first in the 200-yard freestyle with a time of 1:42.88. 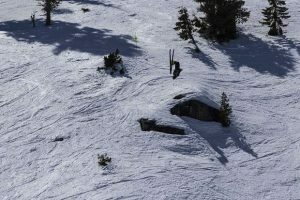 The Truckee freshman broke his femur snowboarding last March, according to Assistant Coach Cyrus Crews, and came back to post his fastest time in the event since the accident. After bringing Truckee its first individual gold medal of the meet, Kaikea Crews closed individual racing at the meet by breaking the state record in the 100-yard backstroke. Crews’ time of 49.66 in the race broke the mark for any division in the state. 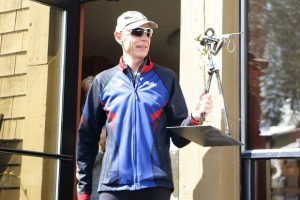 The previous state record was 49.94 and had stood since 1990. De Ryk would break a pair of his own records at the meet, establishing new marks in the 50-yard freestyle and 100-yard butterfly. The senior had set a goal of swimming under 20 seconds in the 50 freestyle, but came up a little shy due to a slow start and losing his cap when he dove in. De Ryk touched the wall with a time of 20.13, breaking the state record he set last year by 0.03 seconds. Olsen was second in the race with a time of 22.75, giving the Wolverines Class 3A’s two fastest swimmers. De Ryk, a Florida State University commit, did swim under 20 seconds in the distance during the 200-yard freestyle relay, posting a split of 19.62. 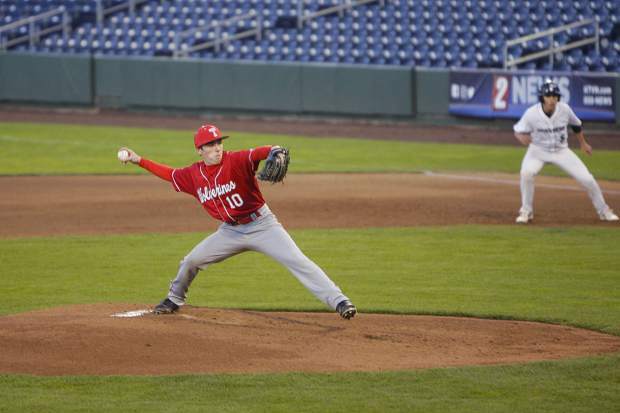 He was joined on that team by Dylan Cole, Evan Opsal, and Logan Kasten. De Ryk went on to top his Class 3A state record in the 100-yard butterfly, finishing the race with a time of 48.84. De Ryk swam 49.87 to set the record at last year’s state meet. The Truckee swimmer will go down as one of the greatest swimmers in Nevada high school history. De Ryk said he will report to Florida State on June 14. Olsen would bring Truckee another gold in the next event, capturing first place in the 100-yard freestyle with a time of 49.38. Truckee’s 400-yard freestyle relay team of Cole, Opsal, and Crews broke the school record in the race, capturing gold with a time of 3:19.59. The Truckee girls team pushed the Eagles with a number of solid swims, but weren’t able to halt Boulder City’s run of state championships, falling 170-150. The girls came away with one first-place performance, capturing gold in the 200-yard freestyle relay. Emma Purdy, Riley Madigan, Megan Darzynkiewicz, and Courtney Engberg combined to finish the race with a time of 1:40.92. Purdy, Caitlin Smith, Megan Burrill, and Engberg took second in the 200-yard medley with a time of 1:53.48. The 400-yard freestyle team of Darzynkiewicz, Madigan, Smith, and Burrill took second in the 400-yard freestyle with a time of 3:47.36. Individually, Madigan and Darzynkiewicz went two and three in the 200-yard freestyle, respectively. Burrill took third in the 200-yard individual medley. Purdy and Engberg also went second and third in the 50-yard freestyle. Incline senior Kate Rye won an unprecedented fourth gold medal in the race, finishing with a time of 24.25. Rye would also win the 100-yard freestyle with a time of 53.64. Smith and Burrill kept Truckee’s run of silver and bronze medals going with second and third-place finishes in the 100-yard butterfly. Purdy and Madigan added another pair of medals for Truckee in the 100-yard backstroke, taking second and third. The Wolverines divers also had a strong showing with Kira Thomas finishing in second place with a score of 258.65. Adrienne Parker was third with 246.95 points, and Elena Tebb was fifth with 184.00 points.